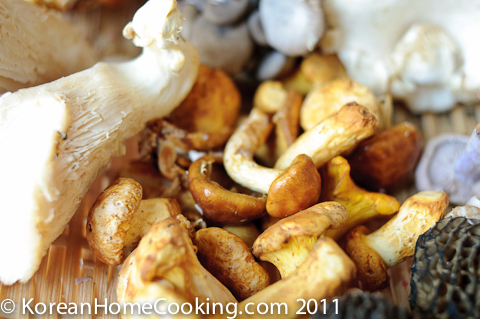 How many different kinds of mushrooms have you eaten in your life? 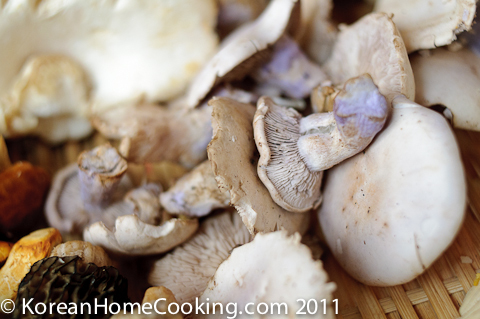 Both Min and I are mushroom lovers, but when we saw a wide array of mushrooms on display at the Monterey Market a few weeks ago we realized there are so many types of mushroom that we have never known about, let alone taste it. 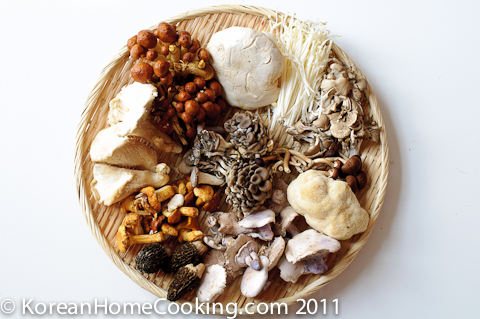 So, we decided to try every single kind of mushrooms sold in the market. The price range varied as widely as from $1 to $20 a pound. 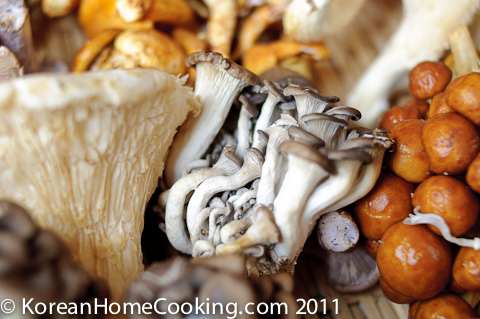 We ended up buying about a dozen different kinds of musrooms totaling more than $40. 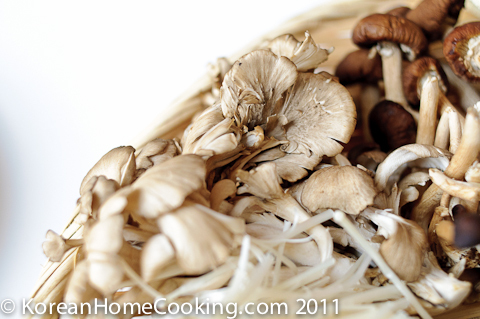 Since there were so many kinds, we left the ones that we normally intake such as shitake, white button, portabella, etc. We bagged each kind in a different bag, and I kind of felt guilty for wasting so many grocery bags. Looking at the long line of mushrooms on the conveyer belt, the cashier asked if we were Chinese. That made me curious whether Chinese buy that much mushroom usually. Each mushroom is so unique in its appearance, and they look like pale flowers. We took pictures of every single one of them before setting onto a unique dining expereience. 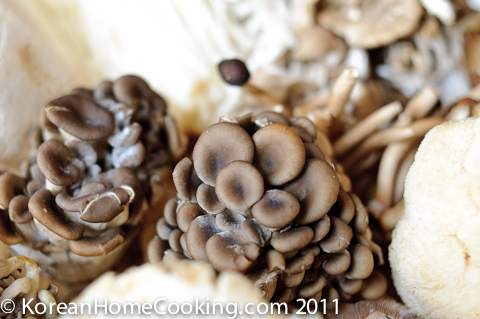 One thing we regretted afterwards is that we didn't write down the names of each musroom when we were at the market. We tried to look up online, but the scientific names kind of put me down. 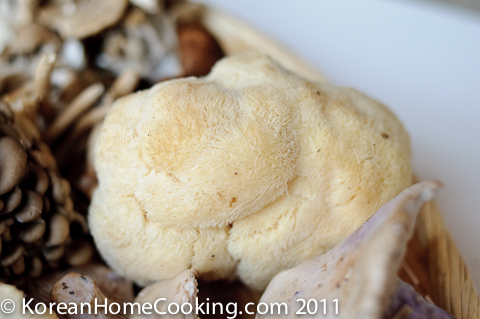 If any mushroom experts out there are reading this post, please share your expertise with me. With all these mushrooms, we decided to make a mushroom hot pot (or mushroom shabu shabu) so that we can taste each mushroom at a time. To enhance the flavor, I added some beef, vegetables, and udon noodles at the end. As unique as their appearance, not a single mushroom tasted the same as another kind. The differences were rather subtle though. 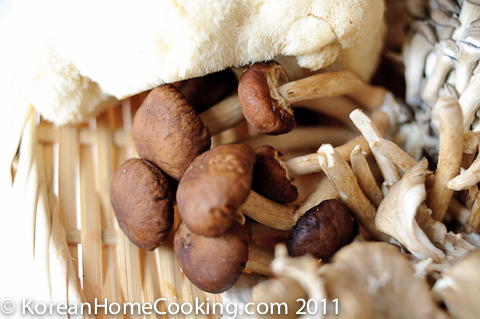 The fun of mushroom hot pot is in noticing this subtle difference in aroma and texture as you eat each mushroom. Yumm.. 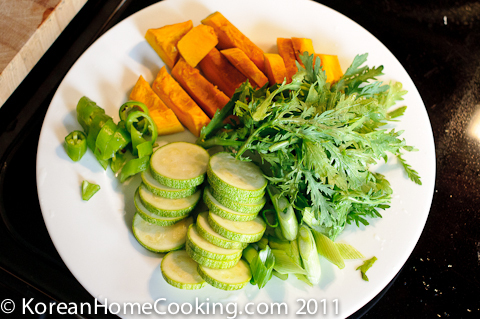 Prepare some vegetables to go with the mushroom hot pot. These are optional. 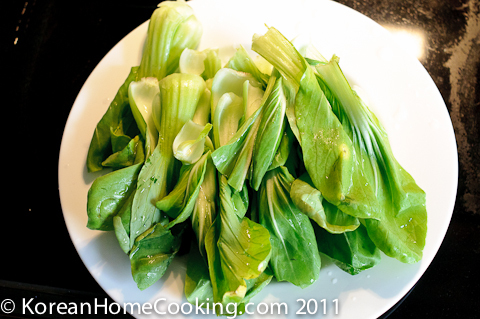 Leafy vegetables like this baby bokchoy makes a good addition to mushrom hot pot. Make anchovy stock by boiling approximately 3 large or 5 medium size dry anchovies in 5 cups of water and a table spoon of Korean soy sauce. If you prefer meat-based stock, you can use beef stock. Add beef first. 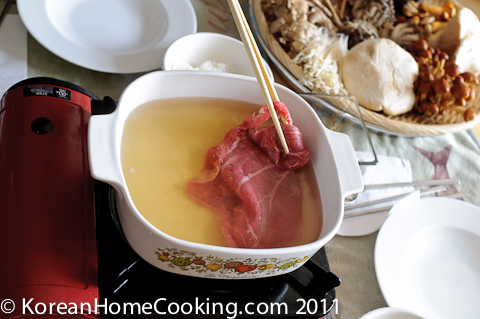 Once the beef starts cooking, add the vegetables and mushroom into the hot pot. 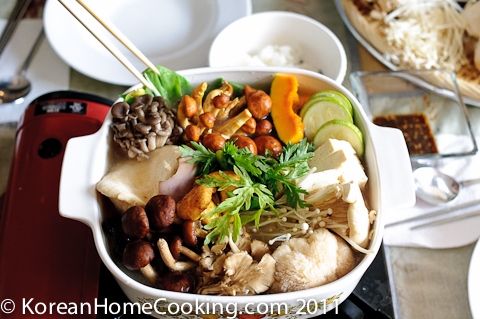 Within five minutes of cooking you should be able to eat mushrooms and beef directly from the hot pot. If it tastes too bland at this time, you can dip in soy sauce. 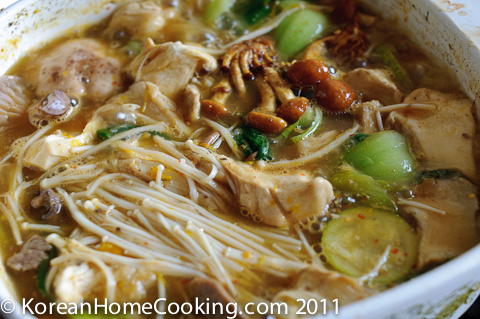 When you are about halfway through, add soybean paste and chili powder to the hot pot and add udon noodle to experience the full soybean-mushroom hotpot. Enjoy. 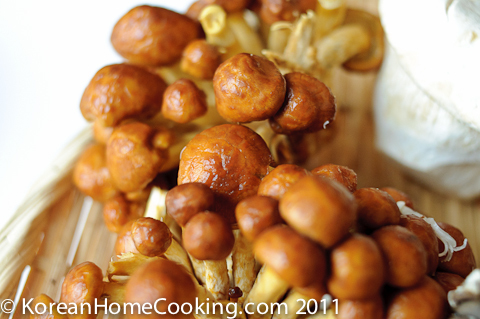 Mushrooms is my favorite food!! I just wanted to leave you a comment... I should've earlier! I've been following your blog for a couple of months now, and I just wanted to say that your blog really saved my life. I'm a college student and thanks to your blog, I'm able to continue eating healthy Korean food instead of the greasy tasteless food here. A lot of techniques that you use to cook is very similar to my mom's and keeps me from missing home too much. Thank you! This looks really wonderful. My problem is not the cooking but the finding of these wonderful ingredients! Not a lot of Korean suppliers here in Tenn, BUT I will try. Thanks for another delicious idea, perfect for fall!!! This blog has been featured on Tasting Korea:) Please check it out. 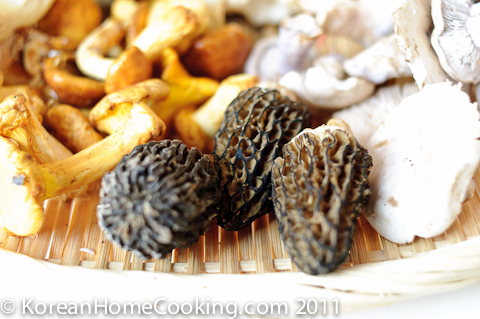 In your first mushroom pic, the dark ones at the bottom look alot like Michigan morels! Migi, where are you? I miss your posts!!! Janicehas afew best replica watches uk seller books under her belt. First one was entitled,No rolex replica Lifeguard on Duty: The Accidental Life of the Word's First Supermodel and replica handbags the follow-up book in 2004 titled, Everything About Me Is Fake andI'm Perfect. What's more beautiful than a shabu shabu dish with a bouquet of vegetables? I'm going to try your version soon. What is Fish Cake Made of?